A deficiency of this vital trace element can be triggered by infection, severe blood loss (for example, from surgery or blood donation), and also through the regular use of painkillers. Insufficient intake of iron or poor absorption rates can also lead to iron deficiency.9WHO: Micronutrient deficiencies. Available at http://www.who.int/nutrition/topics/ida/en/ [05.03.2018] If there is not enough iron available to the body, it uses its stores of iron instead. This phase is asymptomatic. Fewer new red blood cells – or erythrocytes – can be formed and the enzymes that are dependent on iron reduce their activity. Certain methods of preparation, as well as combining certain foods, facilitate increased iron absorption and thus reduce the risk of iron deficiency.22Hurrell, R. & I. Egli (2010): Iron bioavailability and dietary reference values. Am J Clin Nutr. 91, p. 1461S–1467S. Available at http://ajcn.nutrition.org/content/91/5/1461S.full.pdf+html [05.03.2018] To increase the intake of iron from plant sources, iron-rich foods should be eaten together with foods containing organic acids. Examples include fruit such as apricots, which are rich in malic acid, and currants, which provide a lot of citric acid. The presence of these acids can triple bioavailability and, if consumed in sufficient quantities, even reverse the inhibitory effects of phytic acid and polyphenol. Regardless of diet, women tend to suffer from iron deficiency far more frequently than men. Various studies have come to the conclusion that the level of menstrual blood loss, as opposed to diet, is the decisive factor for iron levels in women.31Br J Nutr. (2005): Impact of menstrual blood loss and diet on iron deficiency among women in the UK. Available at https://www.ncbi.nlm.nih.gov/pubmed/16197581 [05.03.2018] People who follow a healthy, varied diet and consume iron-rich vegan food can usually combat iron deficiency without taking supplements. 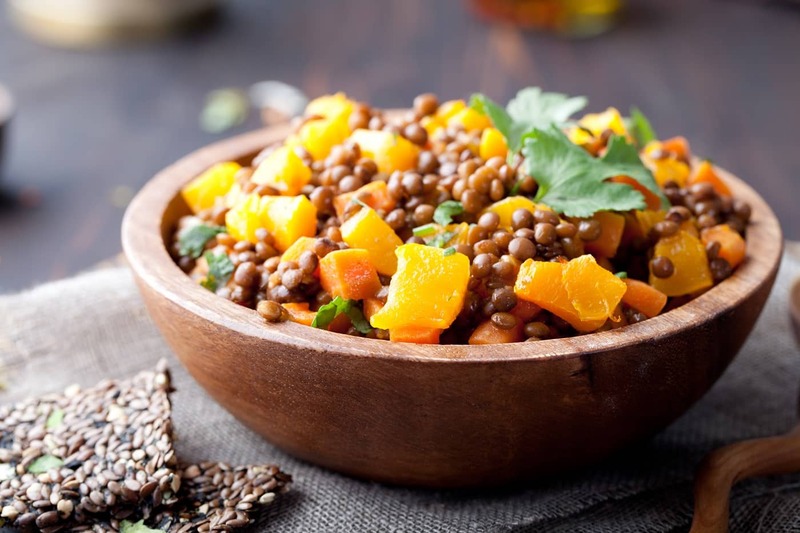 Incorporate various iron-rich foods (such as amaranth, lentils, parsley, and sesame seeds) into your daily diet. Combine vegan sources of iron with foods that promote iron absorption, such as fruits and vegetables with high vitamin C or citric or malic acid content, as well as onions and garlic. Heat, ferment, sprout, or malt iron-containing foods in order to promote optimal iron absorption. If you suspect that you are iron deficient, have your doctor do a blood test to determine your iron levels. 23. ↑ Ledochowski, M. (2010): Klinische Ernährungsmedizin. Springer-Verlag Vienna, p. 278. 24. ↑ Ekmekcioglu, C. & W. Marktl (2006): Essenzielle Spurenelemente Klinik und Ernährungsmedizin. Springer Vienna : Springer e-books, p. 13.